Floods and extreme weather in recent days have displaced about 75,000 people in Malawi, including children who are now in the care of Harrogate supported charity Open Arms. JAMES METCALF finds out more about the orphanages and foster homes affected. A huge thank you is going out to the people of Harrogate for supporting orphaned children in Malawi for the last 20 years, but more help is needed, especially now. Days of torrential rain have caused devastation in the small African country, and Harrogate-based charity Open Arms is operating from the capital Blantyre without water, trying to continue its mission of saving children. Former Ashville College teacher Neville Bevis took over Open Arms as director 15 years ago. Under his direction, a series of projects opening feeding stations, foster homes, and forming village outreach programmes have been launched, expanding support beyond to Mangochi, a very poor area. This, he said, couldn’t have happened without Harrogate. He said: “With 110 children in residence between Blantyre and our second home in Mangochi, life has been difficult. “In Blantyre, our 70 staff live mainly in the surrounding townships where there is very little infrastructure. “Toilet facilities are normally pit latrines and these become lethal and extremely unhygienic in excessive rain when they collapse. “A number of our staff have become homeless and most have experienced some kind of damage. Blantyre is on highland and has avoided the worst of the floods, but in the lowlands hundreds of people are reported drowned with hundreds of thousands left homeless. Nevertheless, the capital has experienced an almost complete breakdown in the supply of electricity, water, and already meagre civic services according to Mr Bevis. This means even more children, in addition to the 670 that have already come through the charity’s doors, will need Open Arms, and this is where the people of Harrogate come in. A new baby was taken in just last week in Blantyre. His name is Ezra and he weighed 4kg on arrival, and he is thought to be over six months old. Ezra was abandoned in the city, where the rain has wreaked havoc. Last week there was no electricity and a number of caregivers who live locally have lost their homes due to the floods. Money raised in Harrogate is helping children like Ezra get healthy, find food, receive an education, and experience the care no-one else can give them. And for this work in Malawi to continue, the link with Harrogate will need to be strong, and Mr Bevis is confident the town’s generous population will rise to the challenge in the years to come. It is 20 years since Open Arms was established and, as of this year, the charity has been directed by former science teacher at Ashville College Neville Bevis for 15 years. However, the charity always needs help because it always needs to be there - there is a constant need, and 2015 will be no different. Emma Vanson is the daughter of Neville and and his late wife Rosemarie, and she is the fundraising manager for Open Arms. She said: “Sadly there is a constant need for us in Malawi. “Whilst maternal mortality figures are falling, poverty is still a huge part of it and a lot of our orphans are orphans because of the effect of AIDS. “At this time of year there is always a rise in the number of children that are admitted to Open Arms because it is the rain season and this year in particular looks like it is going to be disastrous. Emma said, however, that though some people think of an orphanage as a scary place, there is joy to be found and safety for children through Open Arms. “One thing we glean from visitors is that an orphanage is a sad place, but not at Open Arms,” she said. This year, work will begin to support children who have stayed with the charity, because they could not be reintegrated, and are now preparing for secondary school. To try and reintroduce children back into their communities, however, there is an ever-growing outreach programme where matron Mrs Phiri visits homes to make sure children are getting all the care they need. And in villages around Blantyre, feeding stations are built to provide free education and a meal to every child in need. In the last 10 years, Christabel England has visited Malawi 13 times, each time taking gifts and donations from fundraising efforts in Harrogate. When she retired as a general practice manager, Christabel and her husband Derick, from Knaresborough, made the children of Malawi their personal mission. 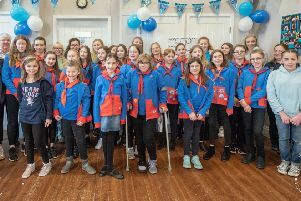 Christabel even turned her 70th birthday celebration this year into a Malawi fund-raising event, and she is a member of Soroptimist International Harrogate and District who help her with fundraising. Director Neville Bevis hosts visitors from across the world, like Christabel and Derick, who are inspired by the story of Open Arms and willing to help. Businesses, like Johnson and Johnson and Travel Zoo, fund projects to build feeding stations and foster homes built by volunteers from schools in the UK, Europe, and the USA. Christabel said: “Open Arms does all this outreach work and the fundraising is voluntary. There is not one penny from government in the UK or Malawi and Neville really is the most inspirational man. There are people who have gone like me and they want to go again. It is such a wonderful experience and I know Harrogate House is very important for children between two and five. “It is absolutely delightful, and without Open Arms there is no doubt those children would have died. “If their mother dies they can’t afford this fortified milk, so the babies would die, so they are recommended by hospitals or social services. Over the 10 years of work in Blantyre and Mangochi, Christabel and Derick have built houses, visited hospitals, knitted hats for premature babies, and taken gifts to prisoners. There are two very special reasons, however, that keep the couple coming back to Malawi. Christabel and Derick met Pemphero when he was two-years-old. Now aged 12, he is the focus of their attention and a success story for Open Arms. While in Malawi, Christabel also does some work for Soroptimist International, a movement to improve the lives of girls and women around the world. She has visited the female prison in Blantyre and helped knit 100 caps for premature babies born at Queen Elizabeth Hospital. In recent years, she has been fundraising to buy uniforms for children. “For the last four years we have been buying school uniforms for the girls who are very bright,” she said. “We find the children who are really deprived and we get them uniforms and a bag and shoes that match. Malawi is one of the poorest countries in the world, with an estimated 74 per cent of the population living on less than 82p a day. The average life expectancy is just 54, and one million orphans are desperately in need of care. About 650,000 of these children are orphaned due to AIDS and for every 100,000 live births in Malawi, 550 mothers do not survive. Open Arms is a charity that provides a transition home for orphans, caring for children who have lost their parents or who are unable to return to their original villages because of poverty, abuse or illness. The first Open Arms infant home was opened in Blantyre in 1995, when two ladies, Davona Church and Margaret East, began caring for 27 babies. Today, the charity cares for more than 100 children in residential homes, and over 400 through village outreach projects. In 2008 a home was opened in Mangochi, where children are cared for until they are about two-years-old. At this time they can return to their communities, nourished and immunised. However, if this is not possible, orphans stay with Open Arms, receiving further care at another facility. Harrogate House was funded by £25,000 raised by Harrogate residents in 2003. It is the home for 12 children aged two to five and nursery education is delivered by a qualified Malawian teacher. From age five, children move to Rose’s House - the first of five foster houses that are supported and administered by Open Arms. To donate to Open Arms, go to www.openarmsmalawi.org/how-you-can-help, text OAIH04 £3 to 70070, or send donations to Open Arms Malawi, Franklin House, 4 Victoria Avenue, Harrogate,HG1 1EL. Plusnet Yorkshire marathon, October 10.